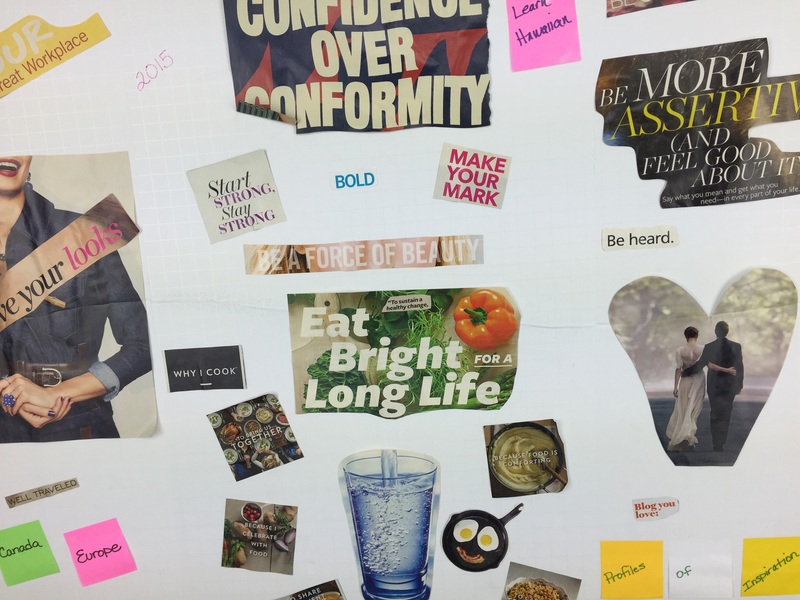 Each year, I go through a process to create a vision board and this includes reflecting on the year. 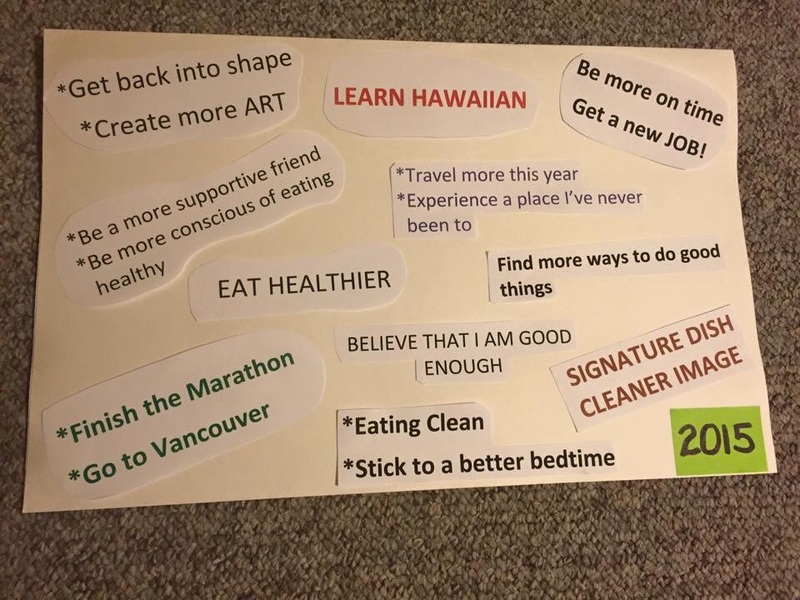 How I view 2016 feeds into my goals for the following year. Losing a loved one to a terrorist attack, my first hospitalization, traveling to six cities, getting engaged and finding out I was pregnant summed up my 2016! Some say it was an “eventful” year but you know, every year is the same. I love my life. I believe it’s how you let the “events” shape your thoughts and shift how you live that filters your lens on life. Let’s start this conversation by talking about my cousin Gail. We celebrate the one year anniversary of her death. She was taken from us during the Brussels terror attacks in March 2016. There is nothing you can do to prepare yourself for losing a loved one. It is typically reactive. I found myself sitting down speechless trying to process the news. Tears and worry for the immediate family soon followed. Memories of her beautiful smile and our times together especially here in Hawai’i flooded me. The balance of embracing her life and moving forward with ours was (and still is for many) challenging. There is no incentive in trying to understand why this happened. However, there is a choice to carry out her legacy in what we do. The legacy she left for me – be fearless. Make life count. Mahalo Gail for making our family stronger. There are definitely logistics and emotional adjustments to adding another human being to our household and I’m confident we will get through all the transitions heading our way. 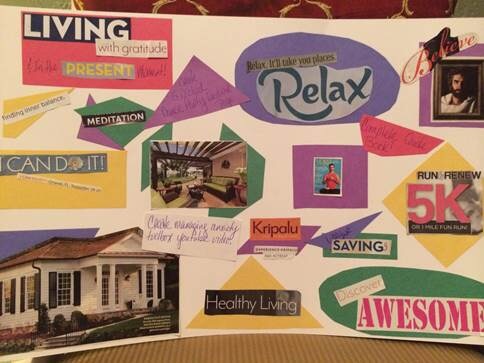 During this third trimester, I’m focused on one area – learning to enjoy the present! I have been fortunate to not experience any sickness or complications you may associate with pregnancy so why didn’t I think it was ok for me to be happy and excited? Well, have you ever felt unsure about committing to a relationship because you weren’t sure if it was going to workout? That’s how it was for me until recently. I frustrated myself with so much worry and fear that I couldn’t see anything positive about my life. I finally told myself enough! It was really my last ultrasound that helped me get over this. It anchored me in such a provoking way. Seeing our baby open and close its hands and move its feet made me speechless. It was simply…amazing. Since then, I touch my belly and talk to our baby often, feeling closer and closer each time. Family and friends have been very supportive during this journey. Donations of clothes, books, and other necessary baby items have been trickling in. People sharing their experiences have been the most meaningful to us and I can’t thank my partner enough. His positive words and back massages help me enjoy each day! The countdown is on! My partner and I can’t wait to experience the world as a family of three thus the goals I set for 2017 are geared towards making our family stronger. Life definitely has new meaning for us. There I was, catching my first glimpse of the outside world in nearly a week. The sight of the clear sky, wispy clouds, and calm ocean blue waters warmed my heart. I was finally relocated to a room with a window which thankfully ended up being my last day here at the hospital. What happened to me was unexpected. It started with a slight pain on my lower right side. Initially, I thought I slept wrong but just a few days later, I woke up Friday morning in pain preventing me from normally rolling out of bed. I immediately made an appointment with my primary doctor however tests didn’t show major concern. I left with no concrete answers. Little did I know that my world would change the following the day. My weekend was packed with chills, fever, and continued pain in my lower right area (primarily the back side). I ended up in the Emergency Room on Monday. The hospital took me in pretty quickly trying to assess my condition. I found myself surrounded with various doctors and staff. The pain is now worsening and I was still experiencing a fever. It was an infection but what type? I was soon hooked up to an IV and getting the good pain medication. I was finally comfortable and they whisked me away to the testing and evaluation unit. My first hospital stay – OMG! Is this really happening? I couldn’t walk, use the bathroom or get out of bed without pain and assistance. Each vein being tapped couldn’t handle the meds via intravenous (IV) for more than a day and a half. They put me on a heart monitor and placed an oxygen mask on me. My breathing became shallow, had very little appetite and I cried when the meds wore off. My immediate family was on the mainland. What the hell was happening? I was frustrated and frankly – traumatized. The doctors debated during the first 24 hours – kidney infection, appendicitis and/or lung infection? They tested and re-tested. The final diagnosis: lung infection of the lower right lobe. Thankfully the treatment was working. Thursday, I was able to walk around the unit at a snail’s pace. My oxygen level and heart rate were normal again. Things were slowly being unhooked from my body. I was feeling better physically and mentally. Saturday, I was ecstatic to learn I could go home! My parents flew out to help with my recovery at home. It doesn’t matter what age you are, being taken care of by your parents, especially by Mom, is SO comforting. My mom showed her love by cooking and feeding me home cooked meals daily along with snacks of course! For the first time, my refrigerator was at capacity!! My dad was always by my mom’s side making sure she had everything she needed. Having them here and spending quality time was priceless. Being hospitalized gave me a new-found appreciation for doing simple things like going to the bathroom by myself. You may chuckle but I’m serious. It felt degrading to know that I couldn’t do simple tasks on my own. Believing that your independence was stripped is a horrible feeling. For me, it was demoralizing and frustrating. This contributed to my depression during my hospital stay. I cannot imagine those who are hospitalized or in a care home/ assisted living indefinitely. Having someone to talk to was important for my mental health. So I encourage you to please visit your loved ones! Your presence and conversations will seriously make a positive impact. Thankfully my boyfriend was there for me everyday, staying the night and distracting me with laughter and talk story sessions. My sister’s phone calls of encouragement, visits and texts from friends were very meaningful. Even trashy television shows like the Kardashians and Housewives of Orange County helped, making me realize that my situation wasn’t as bad, LOL. Thanked my doctor + nursing staff with treats from the Maui Cookie Lady! I also hold a deeper appreciation for our doctors and nurses. They really took care of me and helped me navigate through this challenging journey. I’m forever grateful. It’s been a month since my hospital stay and thankfully I feel fully recovered. I’ll never know exactly how I got a lung infection. There are various ways. What I learned from this experience is how serious this medical condition can be, the importance of a support system, and how truly selfless and unconditional parental love is. His son was named after a favorite wine that he and his wife enjoy, produced from Cade Winery in Napa Valley, under the same ownership as PlumpJack. Chris describes the wine as strong and bold, two characteristics he values. So how has fatherhood changed Chris? It is teaching him to be more patient! I first met Chris six years ago while in San Francisco. His tasting menu at Parallel 37 was my introduction to his superior culinary skills. Chris had no doubt in his mind that he would be part of this demanding industry. He grew up watching “Great Chefs of the World” and dreamt of becoming like one of them. The 33-year old carries an impressive resume. 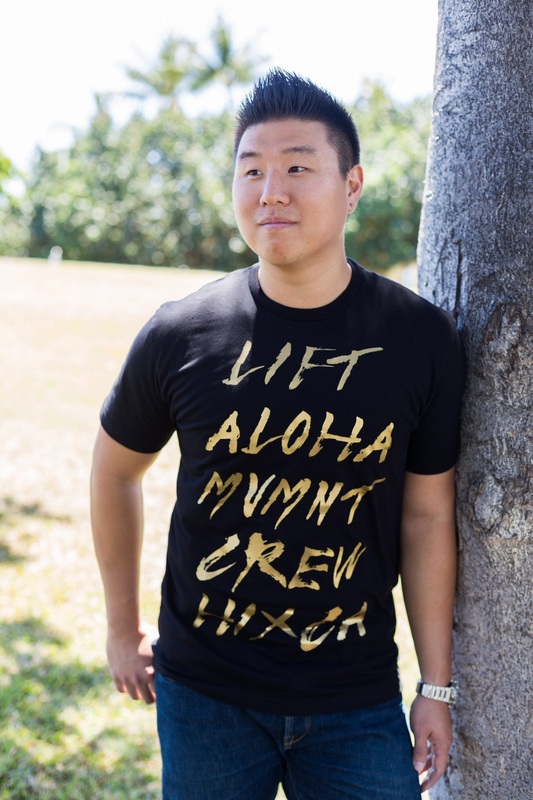 Professional highlights include: graduate of The Culinary Institute of America, award nominations from the James Beard Foundation and Food and Wine Magazine, worked under iconic chef and mentor, Thomas Keller and more recently, former Executive Chef at Vintage Cave in Honolulu. It was his time here that brought Chris international recognition as a chef. However, managing this exclusive fine-dining restaurant and caring for his new born son created the most challenging time in his life. “I was working 16-hour days and mentally exhausted. For the first time in my life, I was burnt out,” recalls Chris. He knew he was letting his wife down while trying to prove himself – needing to do better than yesterday. Chris was desperately trying to survive, mentally and emotionally, through this transition. 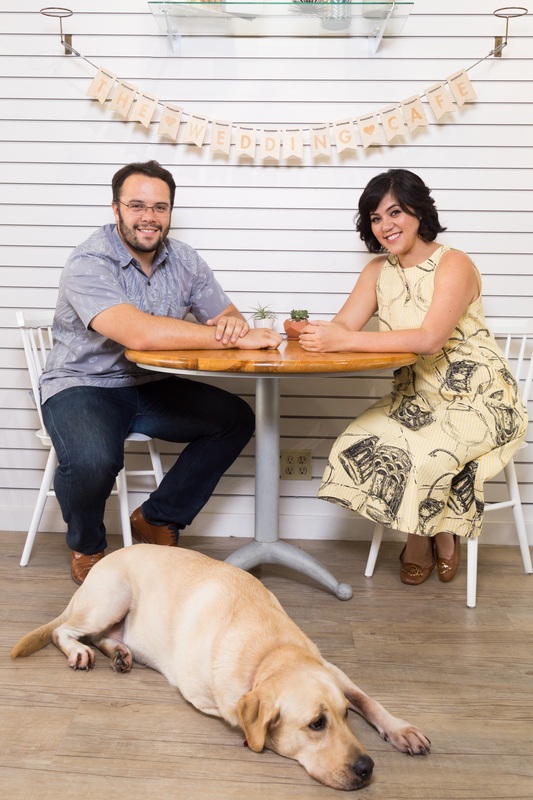 Cade was born nearly a year into opening the luxury restaurant. “Soon after my wife gave birth, I returned to the kitchen and completed dinner service that evening,” he says. That day dramatically changed his life. He chose to make family his priority and departed Vintage Cave in July 2014. Lessons learned? You can’t do everything yourself! In the pursuit of that balance between his love for his family and his passion for cooking, Chris is partnering with Anthony and Katherine Rush to open Restaurant Senia this summer, situated in the vibrant hub of downtown Honolulu (Chinatown) and neighboring the award-winning restaurant, Pig and The Lady. All three met in New York, while working at Thomas Keller’s three Michelin-starred restaurant, Per Se. Since 2007, they have maintained a meaningful relationship. “I trust them with everything,” says Chris. Chris and British native Chef Anthony will create a menu based on items they love to eat when going out. They want the casual-dining restaurant to be a place where people will want to come all the time, a sense of place. Want a sneak peek of Restaurant Senia? They will be hosting a fundraiser event for Easter Seals Hawaiʻi next month. It’s one of four events the non-profit is coordinating this summer across the state through a new unique culinary series called The Traveling Plate. For more details, please follow Easter Seals on Facebook and Twitter. His son and wife being happy, having a sustainable restaurant, and creating a lineage of excellent chefs are what defines success for Chris. “I want to be remembered as a great mentor and Cade’s dad. I want my son to know that I was always there for him.” He wants his son to grow up in the restaurant so don’t be surprised if you see Cade make an appearance during your visit. Chris does have one secret desire – for his son to follow in his footsteps. In fact, he gave Cade the middle name of Thomas, after his mentor Thomas Keller. Describe a memorable childhood experience. Traveling to Europe with our family was one of the most incredible experiences as a child. I remember missing my Jr. Prom for that trip but I didn’t care at all. It was one whole month traveling from the UK to France and then all around Italy. It really made me appreciate the different cultures we were exposed to and even inspired our family to change a few of our habits when we got home. For example, our travels encouraged us to recycle more and taught me to be less wasteful. What values did your parents instill in you? My parents always taught me that education was the most important thing that no one could ever take away from me. In addition to completing my BA in Biology and MA in Communications, I also have my real estate license, and studied ‘Healing Touch’, which is an energy therapy. Through these experiences, it’s allowed me to explore different professional fields throughout my 20’s. Eventually I found my passion in broadcasting. Learning is limitless and will only expand your horizons in life. Lessons learned from your broadcast journalism career? Change is constant and if you are resistant to the evolution of media, then this industry isn’t for you. There will always be someone younger and more tech savvy than you who is hungry and willing to learn so you have to be on top of your game. Through the evolution of media consumption and social media, it has forced the broadcast industry to keep up and I absolutely loved it. What was the purpose of launching Dolkii? Dolkii is a collaboration between my sister Shaiyanne and I. We both knew we wanted to own our own business and this is a combination of what we know best: fashion, e-commerce and social media. Dolkii started as a project in high school, which later evolved into a fashion blog and then eventually into an online store, which launched in 2015. The name came to me after a trip to Pakistan in high school. A dholki is actually a percussion instrument that they use during weddings. It has a very unique sound that evokes the feeling of love, celebrations and can even put you in a meditative state. So, I changed the spelling to reflect my personal take on the word. 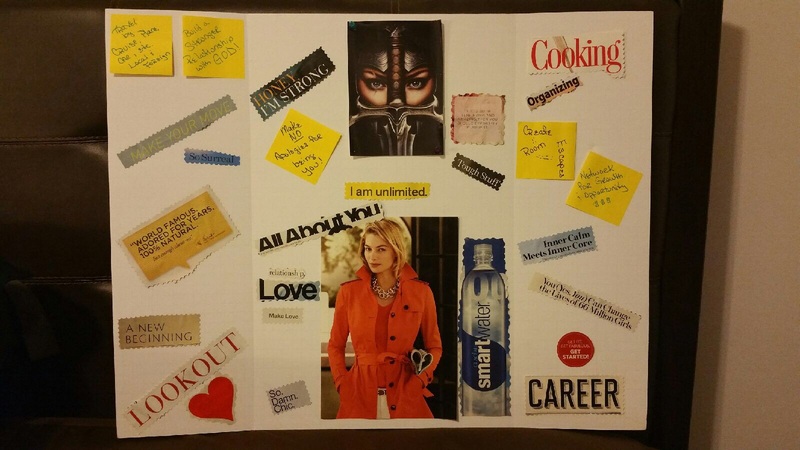 How has motherhood changed your life? Gianluca has brought tremendous joy to both our families. He is a ball of light and pure love! He definitely knows how to test our patience and right now he’s at an age where his little mind is like a sponge. It’s a learning lesson every single day, but I embrace the challenge. Having a daughter (Zoya) really brings it full circle for me because as a female, I want her to understand that nothing and no one can stop her from reaching her goals and dreams. The same is absolutely true for my son as well. I want my children to know that they will grow up to be strong, smart, respectful and giving individuals in our society and that they can achieve anything they want in life. How has family and your experiences influence how you live your life? My mom has always taught me that nothing is impossible to achieve just because you are a woman. You can have a family and a successful career(s) while staying true to your values. Personally, I believe that finding true success in all aspects of your life comes from finding happiness with yourself first. That joy will spread to other parts of your life and becomes a ripple effect onto other people. I also believe that having a partner who you love, respect and support equivocally is also very important. My husband is incredibly supportive when it comes to my endeavors. Not only is he encouraging but he also keeps it real with me. We both focus on what is most important to us to make our businesses and family successful. The key to feeling fulfilled is… to be grateful for the blessings that you receive and to always give in return. No matter how successful you become, always remember to give back to your community. It’s the best feeling in the world knowing that you have made a difference in someone else’s life. Like myself, Lee was born in Japan and raised on the Mainland. He spent most of his life living in Colorado and Kansas, raised solely by his mother. “We struggled financially but my Mom was always giving,” remembers the University of Hawaiʻi alumni. They found themselves in Colorado because his grandparents needed help running the family restaurant. It was his Mom’s devotion to a church that brought them to a university town in Kansas. Then in 2000, during his senior year in high school, they moved to Honolulu to provide support for his aging grandmother. In 2007, Lee’s Mom was diagnosed with breast cancer. “Shortly after her passing in 2012, I dedicated some time to myself and travelled along the Northwest. I needed a break,” explains Lee. During his visits to Seattle and San Francisco, he discovered small ice cream shops that served innovative flavors. Lee soon became passionate about ice cream and began experimenting on his own. He won a food contest at an annual work picnic with his homemade bacon whiskey ice cream. This inspired him to further this interest. 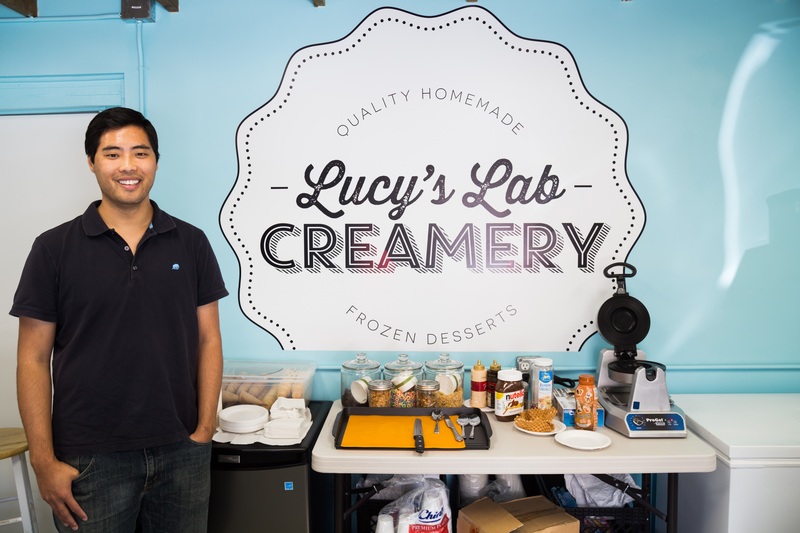 Lee trained at local dairy and creamery farms in Wisconsin and returned to Hawaiʻi ready to open his own ice cream shop – Lucy’s Lab Creamery, dedicated in memory of his mother. A portion of the shop’s proceeds go to breast cancer research. “Ice cream is fun and creative,” says Lee. “It’s an on-going learning experience. Sometimes flavors come out terrible and other times perfect. I love it.” Lee experiments and makes ice cream in a commercial kitchen located in Kalihi. He believes that you have to have good intentions when starting a business. Lee wants his product to create a positive impact within the community. When someone has a good experience, that person will want others to experience the same. Currently, the shop offers eight flavors, ranging from Strawberry Moscato Sorbet to Fruit Loop Vodka. Flavors change monthly and the ice cream is sold by weight. The Pan De Crème makes me nostalgic because it reminds me of a favorite childhood treat. My Mom made ice cream sandwiches for my sister and I using pandesal (Filipino bread roll). 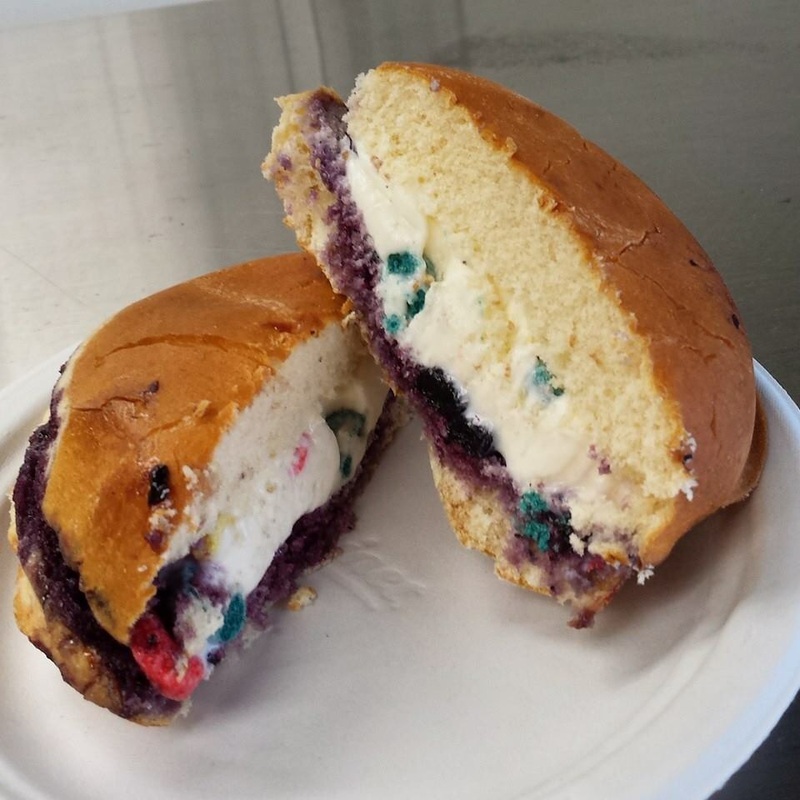 The version at Lucy’s Lab provides you a choice of jam, glossed on the inside of a Hawaiian sweet roll accompanied with a scoop of ice cream. It’s then pressed like a panini so it must be eaten quickly! Lee openly shared the lessons he learned during his first year of business: 1) delegate; 2) give creative reign to staff; and 3) surround yourself with good people. Lee’s grandmother is his biggest supporter. “She’s my cheerleader and matchmaker,” he said with a chuckle. 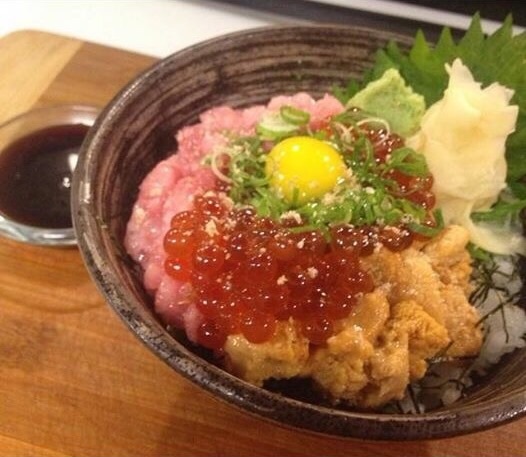 Lee plans to open a second location however no specific details are to be released yet. Lucy’s Lab Creamery is celebrating their one year anniversary this month by giving away free ice cream! Follow them on Instagram, Facebook, and Twitter for details! Donations will be accepted during the event in which all will go to charity. Hawaiʻi is home for me. For nearly 11 years, I’ve been living in a culture that resonates with me. I lived most of my life in communities where being the only Asian kid was normal but my parents raised me in a home where being kind and selfless was customary. Embracing everyone and welcoming them into your home was the norm. After I graduated college, I wanted to move. I didn’t know where, but I knew I didn’t feel grounded enough to stay. My recent chance meeting with Kumu Lauren Kanoelani Chang Williams reminded me of my journey of finding a “sense of place”. It’s Tuesday evening and wahine (women) from all over the island of Oʻahu have gathered at a community space in Nuʻuanu. Mele (chants or songs) and warm smiles fill the open the room. They are eager to learn native Hawaiian traditions and knowledge from their kumu hula (dance teacher). “It’s my kuleana (responsibility) to pass down the ‘ike (knowledge) from my kumu and continue the legacy of our culture,” says Lauren, a Punahou graduate and University of Hawaiʻi alumna. The eldest of two siblings, Lauren was born in Portland and moved to Hawaiʻi at the age of three. She has been dancing hula since kindergarten, studying under Kumu Hula Leimomi I Maldonado (Aunty Lei) for more than 20 years. “I thought I wanted to be a famous hula dancer,” Lauren recalls with a chuckle. In 2009, she completed a year-long rigorous training to ʻūniki (graduate) as a kumu hula. Her dedication along with Aunty Lei’s teachings helped Lauren earn this title of mastery. Kumu hula is a lifelong commitment to the hula tradition. She will forever have responsibilities towards her kumu hula’s teachings and to her own students, and has become a priceless part of the preservation of hula. A year passed before she entertained the idea of starting her own hālau. “I felt it was time to go on my own,” says Lauren. However, this idea did not initially go over well with her kumu. “I wonder if Aunty Lei was not ready to release me and felt hurt that I would leave her hālau. She eventually gave me her blessing but our relationship has never been the same. I constantly think about this,” she explains. Since 2010, Lauren has been focused on carrying out her responsibilities as kumu by sharing her knowledge of hula ʻōlapa (dance accompanied by chanting and drumming on a gourd drum), ʻoli (chanting), and modern styles of hula such as Hapa Haole (westernized hula) through Hālau Na Pua Hala Kūnou i ke Kai. This space has given her the creative direction to choreograph the balance between tradition and hula’s adaptions to the modern world. “Hula is a living art form. A living language. It has always evolved to accommodate changing times,” she says. Lauren does not consider herself to be a strict kumu hula. 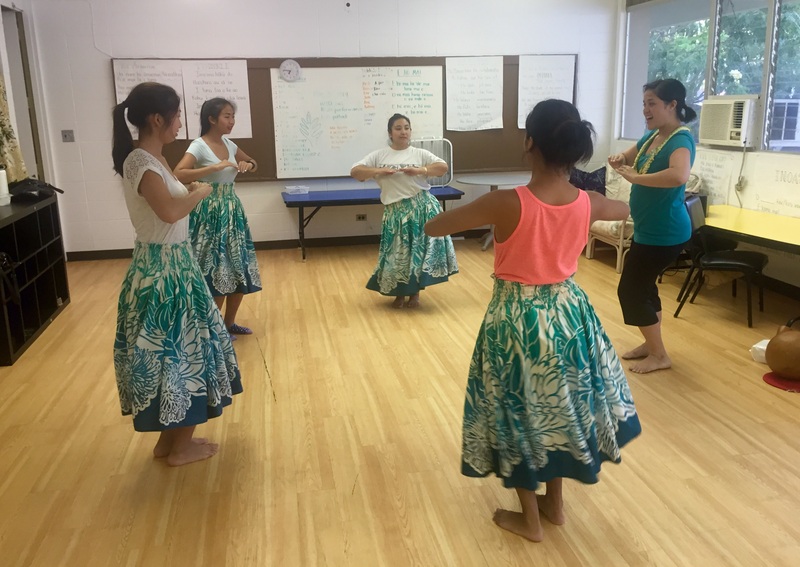 Her intention is to not only provide her students a connection to the culture, but to enjoy hula! She does this by making hula accessible and her teachings palatable. After giving birth to her son, she created a “Mommy and Me” keiki class and a baby wearing hula class so new mothers can bring their newborns to experience and continue hula. “It feeds my heart to teach hula,” says Lauren. Raised by foreign born parents, my sister and I grew up with expectations to graduate from college and have a lucrative career as a doctor or a lawyer. If not this, then at least marry one! Our parents just wanted the best for us. They did not want us to experience the hardships that came along with being financially unstable. For them, education was the solution to financial freedom. Maybe they are right, but what they did not know was that the values we gained and the love we experienced from them would be the most meaningful. My Mom only attained a high school diploma and my Dad joined the United States Navy one year before graduating college for the chance to live that “American Dream.” As second generation, my sister and I were among the first to obtain college degrees in our family but we did not enter the professions our parents wanted. It has only been two months since he publicly launched the business and he is excited to be meeting his goals. The exposure through social media has reached an international audience. He never imagined this one man operation would reach these milestones so quickly. Phillip is focused on maintaining this momentum to reach his fundraising goal of $50k by end of this year.